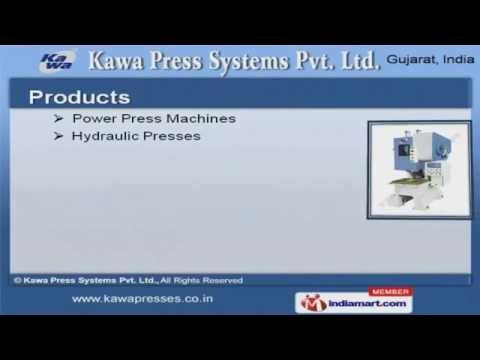 Welcome to Kawa Press Systems Pvt. Ltd. Manufacturer & Exporter of Power Press Machines. We are an ISO 9001:2000 certified company, established in the year 1970, at Rajkot. Goodfinancial position & TQM make us unique in the industry. Bombay Marketer & Batliboi Group are some of our esteemed clients and we are backed byTimely delivery schedule & Competitive prices. We offer a wide array of Hydraulic Presses, Shearing & Press Brake Machines. Power Press Machines offered by us that are well known for their impeccable performance. Line Automation & Tube Light Patty Punching Press are extremely reliable. We offer Hydraulic Presses that are available at industry leading prices. We also provide Press Brake Machines that are a class apart. Along with that we offer Shearing Machines that are well known for their durability.